Free sales training on making appointments that shows you how to make your calls successful and enjoyable. Developed with working sales teams and appointment setters. Proven to work for sales people making their own appointments and self employed small business owners. You'll gain confidence because you'll know what to do and say at every stage of your calls. You'll talk to your prospects rather than hard sell an appointment pitch. You'll enjoy making cold calls even if you hate it now. The links and images on this page will open the free eBook so that you can use it and save it. We don’t ask for any details, no registration, no email address, just click the links or images and the eBook opens. If I asked you to create a new Introduction Stage for you sales appointment calls right now, how would you begin? I ask people to do this in live training sessions and almost always they start with the words they will use. In the ebook course, Making Sales Appointments, I recommend a different starting point and a completely new process for creating appointment cold call scripts. The process starts by defining the complete call in stages. In the free sales training eBook we break the call into 4 stages. We then take the first stage, the Introduction, and we look at the parts that should be included in it to make an effective Introduction Stage. All the parts must have a purpose, an objective, which benefits our aim of gaining agreement to a meeting with a qualified prospect. The result is an effective structure, with no redundant parts, and clear objectives at all times on the call. Then you’re ready to start adding the words. The final step is to add your words to create a sales appointment call script that is unique to you, aimed at your prospects, and uses the features and benefits of the products and services that you sell. This techniques in this eBook have proven successful for employed sellers, self employed people that sell their own services, and small business owners. They also works really well when used to train sales teams. Click the image to open the course and get started. 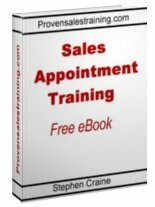 Using the appointment training eBook, available on this page, you go through the steps of the process by following training and exercises to understand how to use each part of the call. The exercises help you to select the features and benefits you will use in each part of the Introduction Stage and this makes it easy to choose the words you will say to create your cold call script. I’ve used this process to train sales people and appointment setters for many organisations, in a wide range of industries, to achieve consistent successful repeatable results. I’ve had great feedback from self employed people, small business owners, and employed sellers, that have all used the techniques and process. 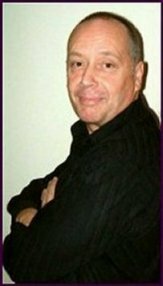 Stephen Craine is a professional sales manager and corporate trainer. The courses and information on this website are the result of over two decades of hands on sales training and management experience. That means the training you'll find here has been developed and refined while working with real sales professionals in a wide range of markets and industries. The selling techniques have been tested and proven while selling to real prospects, not just in classroom role plays. Because real sales people depend upon this training being effective you know that you can also depend upon the results you will achieve when you invest in the courses. With a full money back guarantee, and direct contact with the author via the contact pages of this website, you can see that we have every confidence in the service we offer. What you get is a unique and successful approach to training, on all aspects of selling, that can be relied upon to give you results. You can read more about Stephen, and his goals for this website, by opening the about us page in a new window.